"I am an advocate and lover of Essence Water and I refuse to drink anything else." Mary-Kate FitzPatrick is a 23 year-old commercial television producer and helped construct the first MFA Film and Television Program for Mount St. Mary’s College, where she received her Bachelor of Science in Film, Media, and Social Justice. She is a commercial model and actor and is in the running to be the next Miss California USA 2015 representing Hollywood Hills. Mary-Kate is most known for her weight loss journey documented nationally by E! "“We are so excited about carrying Essence Water at our stores because it has no sodium which is good for people with high blood pressure. It also has the antioxidant Hibiscus which is really in the news lately because of how good it is for our cardiovascular health.”"
Chazz Weaver - Producer of ChazzLive! "Essence Water helps me maintain my youthfulness by assisting to restore my body's natural pH by means of flushing acidic toxins from my body. Add on top of that, Essence Water's antioxidant power of organic Hibiscus makes Essence Water the only water I drink to help maintain my health. As producer of a wildly popular online streaming fitness show that helps people make healthy simple choices, I have decided to make Essence Water the OFFICIAL WATER of ChazzLive. 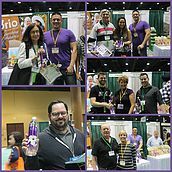 Our entire team is helping educate the world about what a sustainable pH10 water can do for our overall health and well being." Tune into ChazzLive.com and see Essence Water’s very own Dr. Jason Littleton speak about how to create and maintain great energy all day long. Free membership subscription by using the access code: WATER. "I drank half a gallon a day in the weeks leading up to the MissCalifornia United States pageant! Now, I keep gallons of it in my trunk so I have Essence Water wherever I go! Essence Water makes me feel so fresh and hydrated, not to mention how it definitely improved the way my skin felt during all the makeup/costume changes. I never leave home without my Essence pH10 Water!" "There is nothing more important than hydrating with a sustainable alkaline water. I found Essence Water pH10 and I truly believe it is the best water on the market. The antioxidant content along with the pure refreshing taste makes me crave it. I recommend it to all!"